Yet another state commission, this time Maryland, has concluded that solar provides substantial value to the state overall, and specifically to the operation of the grid. While most of the value of new solar added to the state economy is during the year of installation, the cumulative value of solar to the state utilities as cost avoidance for new local infrastructure investment was also found to be remarkably high. As part of a broader investigation begun in 2016, the Public Service Commission of Maryland issued its final report November 2 on the “Benefits and Costs of Utility Scale and Behind the Meter Solar Resources in Maryland,” and found economic returns of over $7 billion over the coming decade, assuming new solar keeps up its growth drive. Despite a substantial cost for the expected solar installation, the retained returns are comparatively high. “Based on our assumption that the incremental solar case requires a capital investment of approximately $5 billion, this means that of every dollar invested in solar in Maryland, approximately 40 percent of the benefit stays in the Maryland economy,” the report reckons. The avoided cost benefit of solar in Maryland in terms of state-wide transmission line investment was calculated “to range from $0.001 to $0.005/kWh (kiloWatt-hour) between 2019 and 2028. Avoided transmission charges ranges from $0.0011 to $0.0020 per kWh between 2019 and 2028,” the report calculates. The analysts considered solar as a distributed energy resource separately, since the impact is very localized. 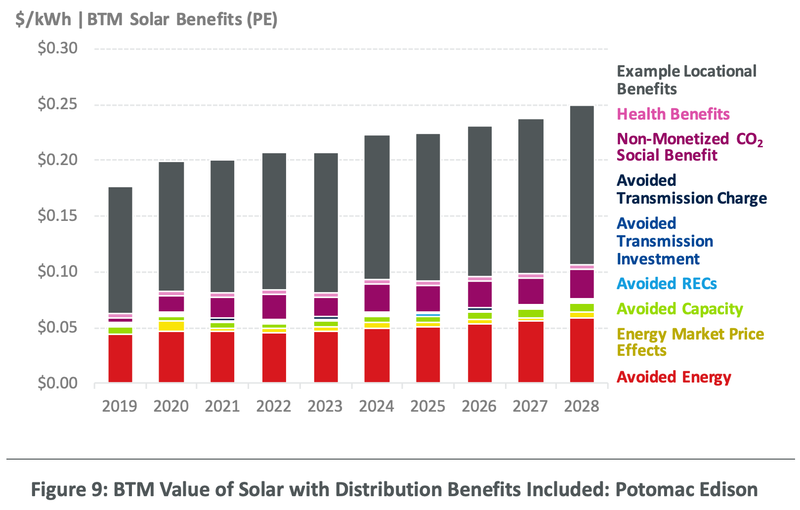 “Distribution system benefits are not included (on the earlier stack charts) as they are location specific, but these benefits could add significantly to the value of solar if projects are sited appropriately. For example, a 2 MW project that avoids a $2 million distribution investment, could add $0.11/kWh in additional locational benefits,” the report projects. The report was prepared by Daymark Energy Advisors, ESS Group, and RLC Engineering, and covers the four investor-owned utility companies providing distribution services in Maryland: Baltimore Gas & Electric or BGE, Delmarva Power & Light or DPL, Potomac Electric Power Company or Pepco, and Potomac Edison or PE. The analysts used the PVWatts3 analysis tool developed by the National Renewable Energy Laboratory to develop the generation output information in the study. The analysts found surprising solar growth in all installation size market segments in the state, which produced solar energy generation of 890 gigawatts as of June 30, 2017. “Starting in 2012, residential solar capacity additions began to surpass those in all other installation size types. The capacity additions from the residential type then grew exponentially between 2009 and 2017,” the report found. “From 2003 to 2009, output was low and steady from both residential and small commercial/industrial sources. Between 2010 and 2016, large commercial/industrial installations accounted for most of the generation. Utility-scale generation was a close second until 2016 when it surpassed large commercial/industrial output. Residential output began significantly increasing in 2016 when it almost matched utility-scale output and then surpassed it in 2017,” the analysis reports. The state currently has a renewable portfolio standard (RPS) of 25% renewables by 2020. But Maryland is far from overbuilt when it comes to solar, the analysts discovered. Available sites for rooftop and commercial solar additions amount to 25.7 GW, while utility-scale solar sites would permit another 115.7 GW of solar, the report notes. The conclusion of the report was simple: “The large potential for additional behind-the-meter (residential and commercial) and utility scale solar development, and the significant value that solar can bring to the bulk power system, distribution system, and to the residents of Maryland through macroeconomic and health benefits, represent a considerable opportunity for the state,” the analysts pronounced. “The state and investor owned utilities should consider developing policies and enhancing utility system planning processes to encourage additional cost-effective solar development.” Go solar.